This article is about the council area. For the UK Parliament constituency, see Argyll and Bute (UK Parliament constituency). For the Scottish Parliament constituency, see Argyll and Bute (Scottish Parliament constituency). 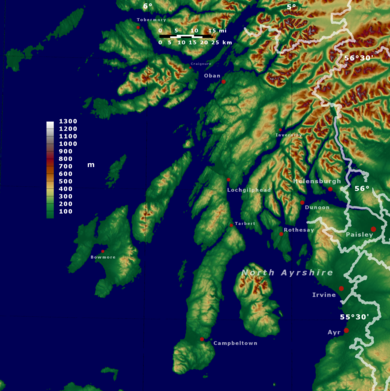 Argyll and Bute (Scottish Gaelic: Earra-Ghàidheal agus Bòd, pronounced [ɛrˠəˈɣɛːəlˠ̪ akəs̪ ˈpɔːtʲ]) is both one of 32 unitary authority council areas and a lieutenancy area in Scotland. The administrative centre for the council area is in Lochgilphead. Argyll and Bute covers the second largest administrative area of any Scottish council. The present council area was created in 1996, when it was carved out of the Strathclyde region, which was a two-tier local government region of 19 districts, created in 1975. Argyll and Bute merged the existing Argyll and Bute district and one ward of the Dumbarton district. The Dumbarton ward, called 'Helensburgh and Lomond', included the burgh of Helensburgh and consisted of an area to the west of Loch Lomond, north of the Firth of Clyde and mostly east of Loch Long. The council area can also be described by reference to divisions of the counties which were abolished in 1975. The council area includes most of the county of Argyll (Argyll minus the Morvern area, north of Mull, which became part of the Highland region in 1975), part of the county of Bute (the Isle of Bute) and part of the county of Dunbartonshire (the Helensburgh and Lomond ward). The Cowal Peninsula route by Caledonian MacBrayne subsidiary, Argyll Ferries operates the Public Service Route, which is a passenger-only service, from Dunoon Breakwater to Gourock pier, giving easy access to the National Rail Network, in direct competition with private service provider Western Ferries Clyde LTD who ply the Hunters Quay to McInroy's Point route. The Colintraive in Cowal to Rhubodach on the Isle of Bute route, across the Kyles of Bute, is operated by Caledonian MacBrayne. The Portavadie in Cowal to Tarbert on the Kintyre Peninsula route, across Loch Fyne, is also a Caledonian MacBrayne service. In February 2012, the council was criticised for allegedly setting up "spy" accounts on social media. As a result of the investigation, a council employee was suspended for setting up "fake social media accounts to monitor what was being said about the council". The council's own investigation later confirmed it had "found no evidence of any form of spying or covert surveillance having been carried out by any employee within the council's communication team." In June 2012, the council was heavily criticised for banning a local primary student, Martha Payne (aged 9), from taking photographs of her school dinners for her online blog. The blog, NeverSeconds, had been praised by the celebrity chef, Jamie Oliver, had attracted over two million visits, and at the time of the ban had raised nearly £2,000 for a food charity. On the day the story broke, the blog had raised over £40,000. After an initial statement from the council defending the decision, the ban was subsequently overturned by council leader, Roddy McCuish. In November 2012 a book written by David Payne, father of Neverseconds blogger Martha Payne, revealed the background to the council's attempt to censor and bully a 9-year-old girl. The book states about the council: "My anger and frustration at Argyll and Bute Council was not being soothed by time. Thinly veiled attacks on our parenting on national radio and an abusive phonecall stood out as examples of a public body sick to the very top. Complaints via the proper procedures and through elected councillors had brought no visible changes. Far from being contrite they seemed to take a pride in being untouchable." ^ "Welcome to Argyll Ferries". www.argyllferries.co.uk. ^ "Social Media Spying". Bbc.co.uk. 2012-02-10. Retrieved 2012-11-25. ^ Argyll and Bute Council (2012-08-23). "Argyll and Bute Council – Meetings, Agendas, Minutes". Argyll-bute.gov.uk. Retrieved 2012-11-25. ^ Hough, Andrew (2012-06-15). "School Dinner Blog Banned By Council". Telegraph.co.uk. Retrieved 2012-11-25. ^ "NeverSeconds blogger Martha Payne school dinner photo ban lifted". Bbc.co.uk. 2012-06-15. Retrieved 2012-11-25. ^ VEG (2012-06-14). "Goodbye". Neverseconds.blogspot.co.uk. Retrieved 2012-11-25. ^ "Mary's Meals and NeverSeconds' Martha Payne". Marysmeals.org.uk. Archived from the original on 2013-01-27. Retrieved 2012-11-25. ^ Mary's Meals. "Veg from NeverSeconds". Justgiving.com. Retrieved 2012-11-25. ^ "Statement on school meals from Argyll and Bute Council". Argyll-bute.gov.uk. 2012-06-15. Retrieved 2012-11-25. ^ Peterkin, Tom (2012-06-16). "Food blogger Martha Payne enjoys taste of victory". Scotsman.com. Retrieved 2012-11-25. ^ "From Russia with Love (1963)". Wikimedia Commons has media related to Argyll and Bute. Wikivoyage has a travel guide for Argyll and Bute. This page was last edited on 3 April 2019, at 09:32 (UTC).